I read and share so many excellent contemporary books for tweens, but I still hear from parents who want their kids to read the classics. But most tweens are not ready for Dickens or George Orwell! 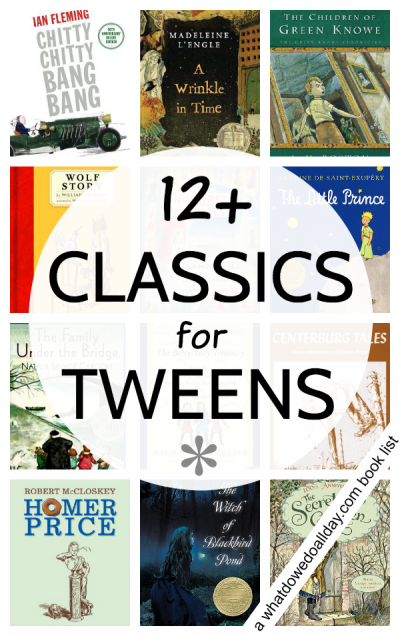 So, what are some good classic books for tweens? 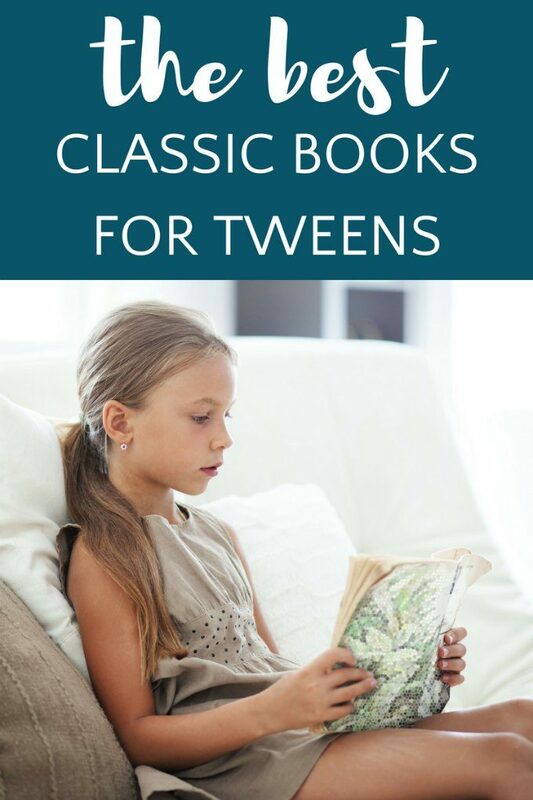 Although the word “tween” is a new-fangled one, kids ages 8-12 can certainly appreciate a classic book. And what defines a “classic” book, anyway? I’ve decided, for purposes of this tween book list, that all books must be older that me (!). That is completely arbitrary, and since I’ve called books from the 1990s “classics”, I make no claims for consistency. But there you have it. Do some tweens resist classic books because they perceive them as boring? 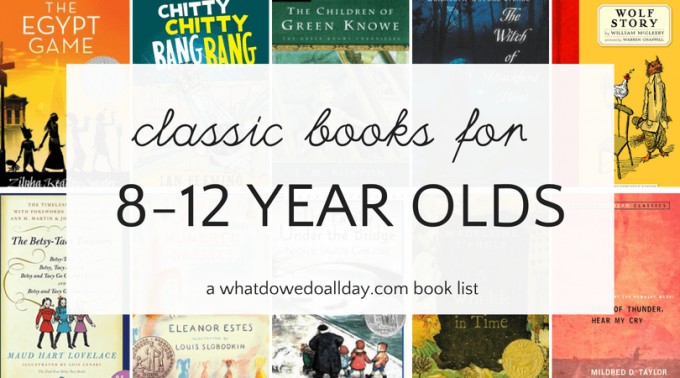 Well these classic books for tweens are everything but boring! I included some titles your children will most certainly recognize, but also a few which may even be new to parents! I also made sure to include a lot of humor, but you will find realism and even science fiction, as well. If your 8-12 year old doesn’t want to pick up a classic book on his or her own, why not try reading one of these aloud? The Egypt Game (1967). My son loved this book (as did I). A group of friends hang out near an old curio shop and engage in some imaginary world building. Mysterious and suspenseful, it will be especially loved by kids who like all things Egyptian. Chitty Chitty Bang Bang: The Magical Car. (1964) Do not judge a book by its movie! This humorous tale by the author of James Bond is great fun. The crazy Pott family purchases a car that can fly as well at catch criminals. Perhaps not as deep and meaningful as some of the other books on this list, but tweens don’t need every book they read to change their views on life! The Little Prince. (1943) I remember reading this book for the first time when I was in 3rd grade, which may be a little young. I think tweens are at a good age to start thinking about the wider philosophical ideas presented in this classic book about a prince who finds himself on a strange new planet. The Children of Green Knowe. (1954) Tolly goes to live with his grandparents in their ancient but magical English manor house. He meets a few new playmates to keep him company. He discovers, however, they are not quite of this world. There are six Green Knowe books to keep your kids reading. The Betsy-Tacy Books. (1940) Not just a classic book for twee girls! These tales of three friends in early 20th century Minnesota will appeal to kids who love history. If you find your kids are constantly reading fantasy books (nothing wrong with that!) add a little variety with these books. Tweens often want to read books about teens and they can read all the way through Betsy’s teen years without parents having to worry that their kids are reading YA material that is not quite appropriate yet. Roll of Thunder, Hear My Cry (1976). Told from the perspective of a nine year old girl, this is an incredibly powerful book about an African-American family who struggles against racism in the South in their fight to keep their land and their dignity. If I were to make a list of books all children in the US must read, this one would be on it. Wolf Story (1947) may be a new-to-you classic book, and I hope you will encourage your tween to give it a read. Five year old Michael wants his dad to tell him a story about a wolf, and a hen named Rainbow, but as five year olds will do, he keeps interrupting to instruct his dad on the story details. A humorous short novel which is also great for reading aloud to younger kids. The Hundred Dresses. (1945) Eleanor Estes’ 1945 book deals with bullying, poverty and courage. A classic, moving story that should be on everyone’s shelves. The Secret Garden (1911) is a timeless tale about how a sullen 10 year old girl, sent to live with her uncle in Yorkshire, discovers a walled garden which changes her life and those around her. This has been on my to-read aloud list for quite some time, but I also hope to get my almost 10 year old to read it independently. The Boxcar Children (1924, but has been re-written). This is usually recommended as an early chapter book, but not all kids read advanced level books when they are 10 years old, and the Boxcar series mysteries are appealing. This is still an enormously popular series today, but you many not realize that the first book was written in 1924! Four orphan siblings try to make an independent life for themselves by living in an abandoned train car. There are now more than 100 books in the series (!). The Family Under the Bridge (1958) At Christmas time in Paris, Armand, a self-proclaimed hobo who loves his responsibility-free life, takes a homeless family under his protection. In doing so he decides it might not be so bad to have permanent ties after all. This sensitive, touching story is a great read during the holiday season. A Wrinkle in Time (1962) was a favorite of mine as a kid. It is part of a trilogy, yet I can’t really recall the plot of the other two books! The mix of fantasy, science fiction and mystery is a perfect combo for tweens. Meg’s father has gone missing after working on a secret government project. Meg, her genius brother, Charles Wallace and a school friend are transported through the tesseract, in an attempt to find her father. The Witch of Blackbird Pond (1958). 16 year old Kit leaves her home in Barbados, only to find herself smack in the middle of Puritan New England and a life that is very different from her own. Kit later becomes a target of the villagers’ fear and is accused, along with her friend, of being a witch. This book is perhaps best for older tween, and is a great way to start a conversation about tolerance, social pressures and compassion. I would definitely include the Anne of Green Gables series, my favorite at that age. although some of the classics you list are also favorites of mine and my Kiddo when she was young. imagine my delight in finding (as an adult shopping in Costco) that there are actually five books in the Wrinkle in Time series! This is one of my favorite series as a child, so I immediately bought all five and have read them again and again. I love your book lists; they always have some favorites and delightful new discoveries! That’s news to me, I thought there were only 3! 5! I thought there were only 3! I can’t believe I’ve never read the Betsy-Tacy series! I will be finding them pronto and reading together with my 9 year old – who has just finished On the Banks of Plum Creek and declared the first chapter of These Happy Golden Years to be “dreadful.” Thank you once again ! If she likes Laura, she’ll love Betsy! Children of Green Knowe! I try to read that every christmas! I can’t wait to read it to my children (though i think i need to wait a few more years, since it’s a bit much for a newly 4 and 6 year old.) The bbc did a great tv adaptation of it when I was a child. I think because it’s a British book, not as many people in the States are familiar with the series. I hope to change that! Thanks for the suggestions! Two of these I’m not familiar with. Several of the others are on our classics by the decade lists. Great choices. Ooh! Yes! Wolves of Willoughby Chase for sure! Anything by Joan Aiken actually. Go Saddle the Sea is another good one. CS was my favourite book along with Tom’s Midnight a Garden back in the 70s. Carrie’s War,The Machine Gunners and When Hitler Stole Pink Rabbit are great wartime favourites over here. The Phoenix and the Carpet was made into a fab BBC series in the 70s but is nowhere to be found anymore.The book is a good read too.If you go on Children’s Books on Mumsnet you’ll find loads of classics recommendations I’ve prob forgotten. Wait! You forgot Sweet Valley Twins! (Just kidding, hee hee.) I love The Hundred Dresses, Homer Price, and recently discovered and devoured the entire Betsy Tacy series. I wasn’t able to get into The Secret Garden. Maybe I should give it another go. Ha ha ha! Well, SV are classics… and I did LOVE them when I was that age. ….. I totally agree with those above who suggested the Anne of Green Gables series. I also recall fondly the Boxcar children. Maybe someone out there can help me remember the name of the book/author re: a story in Europe, probably Eastern Europe, post WWII. It might have taken place in Poland. A collection of people, some related, came to live together in an old farmhouse. That’s about all I remember, and it’s driving me nuts that I cannot find the name of the book, or its author. Hmmm. That doesn’t ring a bell. It’s so frustrating when you can’t remember the name of a book. We are reading a two book series that sounds like what you are describing – The Ark and its sequel, Rowan Farm – by Margot Benary-Isbert..about a family in post WW2 Germany that comes to live on a farm with other people who have been displaced by war, etc. Very heartwarming. The author has been compared to Louisa May Alcott, but I think she’s better! Great selections. I’d add Island of the Blue Dolphins, From the Mixed Up Files of Ms. Basil E Frankweiler, The Westing Game, and the Narnia series! Swallows and Amazons series by Arthur Ransome. Would you recommend reading Children of Green Knowe to fourth grade students? I’m currently searching for read aloud books. Amazon reviews suggest this book is a bit spooky. What do you think? Since it’s a classroom and you aren’t sure about all the kids’ sensibilities, it might be better to choose something else. My son is a fourth grader and his teachers are reading Bridge to Terebithia and he says the kids love it. I couldn’t bear the idea of putting lists of classics on the library website, knowing they’d all be about white people, so I got around that by making them lists of “classics, old and new”. The Mixed-Up Files of Mrs. Basil E. Frankweiler!